There's something off about the angle of her face here. I believe it should be a bit rounder. 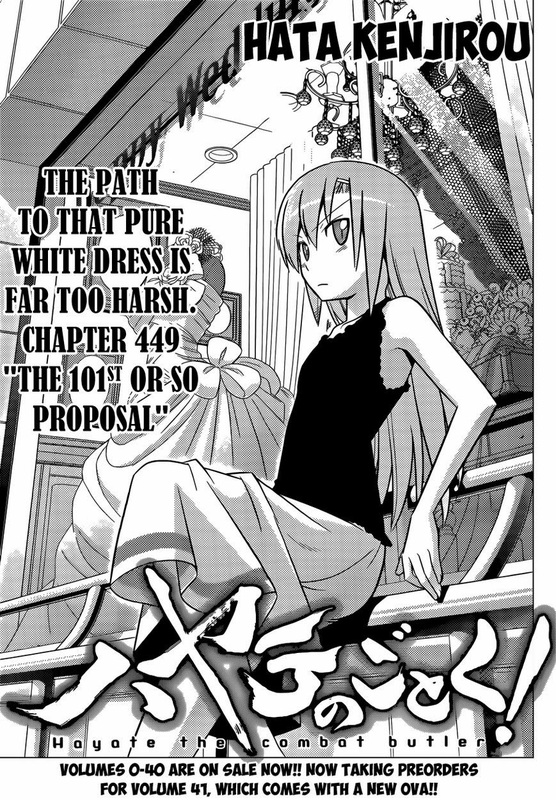 Synopsis: After a brief reminder of how Hinagiku and Hayate ended up on murder island and got separated from Mini-Athena (and that the mangaka is well-aware that readers are aware of the delaying tactics that he's been using), Hayate and Hina somehow make it out of the underground cavern that they fell into in one piece and are now continuing their search on the island for a legendary spice. Hata is a self-aware troll. Hayate is pretty busy seriously looking for this legendary spice that will dramatically improve the flavor of the seaside restaurant's curry so he can win his bet with Ikusa. Hayate ponders if there might be a sign and voila! He gets a picket sign that literally points them in the direction of the legendary spices. Meanwhile, Hinagiku remembers Chiharu's advice to her to "go on the offensive" and she does just that. In fact, she makes several attempts at a confession -- thus, you definitely can't fault her for not putting any effort into it. First, she goes "the moon is beautiful, isn't it?" 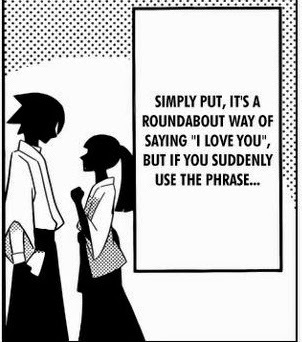 Haven't seen the raws, so I'm not sure what it actually said in Japanese, but I have read that the Japanese didn't have an official term for "I love you" in the past and thus, they used this term. 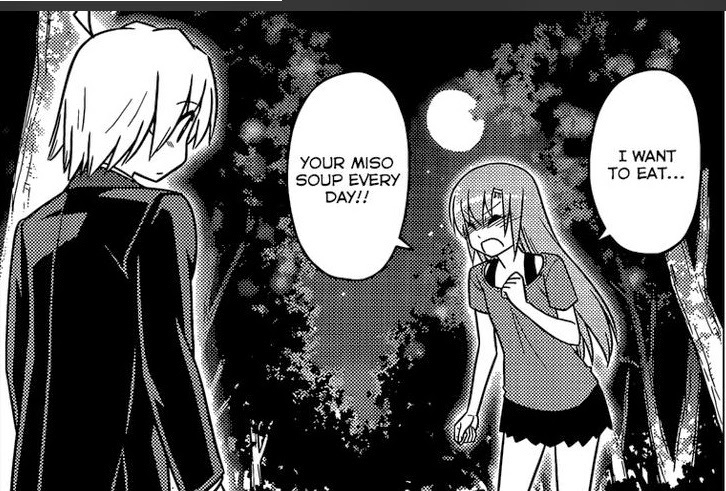 Of course, Hayate totally doesn't get it and thinks that Hinagiku is literally talking about the moon. Seeing that Hayate doesn't get her "confession" at all, Hina gets a push via a "Hamster flashback" and confesses again; this time with, "I want to eat your Miso Soup every day!!" 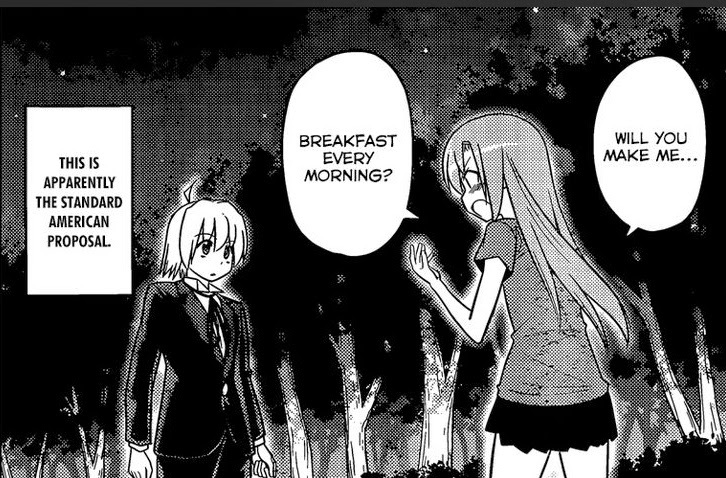 Hayate is all business and tells her that curry is far more important right now. Next, Hina gets some advice from Aika as "The Love Master" inside her mind who tells her to use a more western and fashionable phrase to make him understand. So she goes, "Will you make me breakfast every morning?" This is her idea of a standard American proposal according to the narrator. 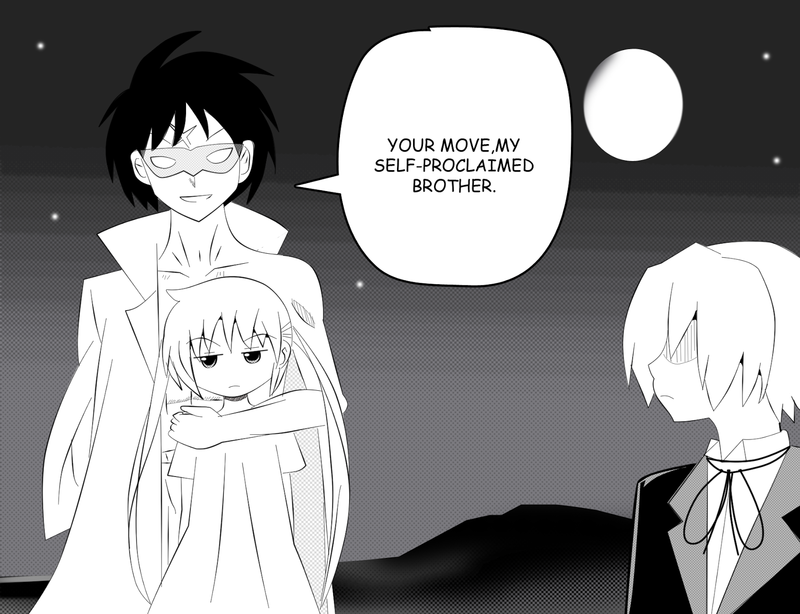 Again, Hayate takes her words literally. He says that he already does that right now (which he does) and thinks she's just hungry. They eventually stumble upon an abandoned village and Hayate offers to try and make Hina some food, but she says she's not hungry... just in time for her stomach to start growling. Hina is saddened a bit by Hayate's reactions to her apparent confessions and thinks that he might be deliberately ignoring her. She finds the diary of a villager who was going to confess to the one that she loved. The diary ends with the villager writing down that she just needs to honestly tell the person that she likes that she loves him because she wants to live a life without regrets. Hina thinks this is a pretty good idea, but before she can continue, she spots a second diary belonging to the same villager. Upon opening it, she realizes what a big mistake she would have made because the villager got rejected and was writing in full-on yandere mode. 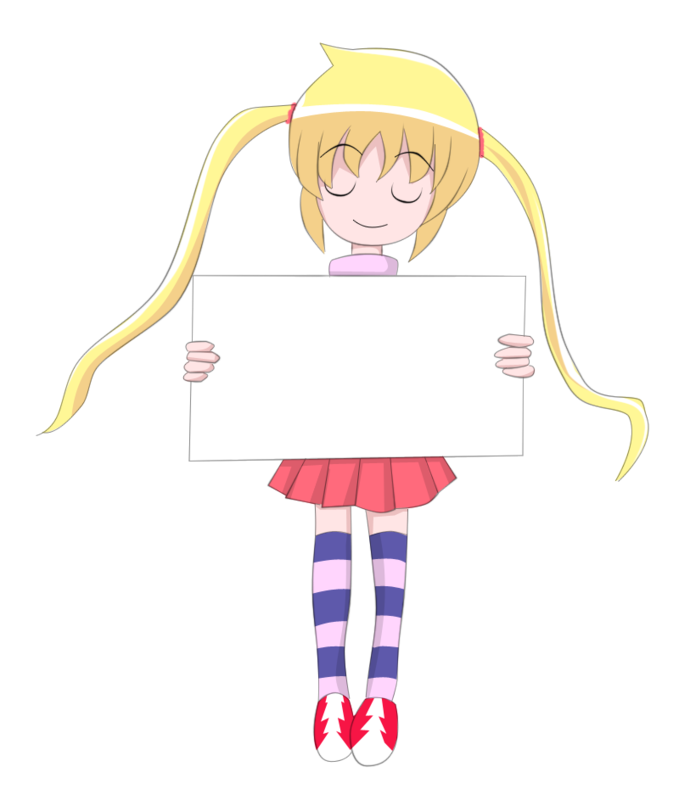 Hina closes the diary and thinks to herself that she's glad that Hayate is so dense. Can't fault her for not trying. 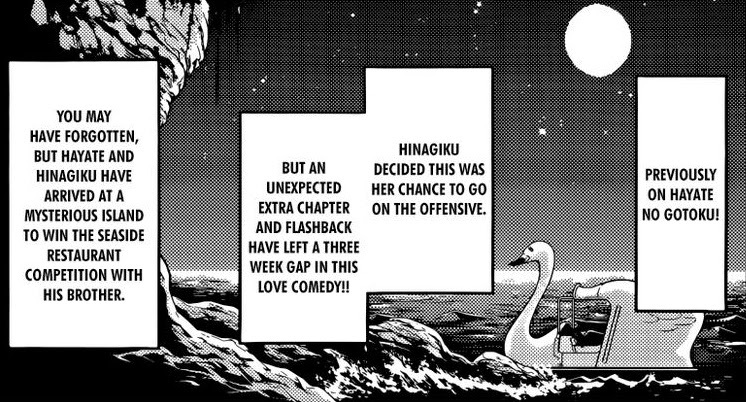 Review: That was a pretty hilarious Hina chapter. Also, the confession scene went pretty much as I expected it to go with Hina trying her best to confess, but with Hayate being pretty much oblivious to everything she said. I had expected him to actually understand her confession and then find some way to pussyfoot around the subject, but Hata shows us that our oblivious butler is far more oblivious than that. Of course, we could also partly attribute that to Hina not being very direct with her confessions. Yet, perhaps that might have been a good thing for her, as she seems to realize herself at the end of this chapter and as pointed out by Doughnut Gunso; it's better for Hinagiku and Hayate's "romance" to develop slowly as they're both pretty dense when it comes to that department. With that said, please take note that this particular blogger is forever on the Nagi x Hayate ship. I'll be a good sport when/if my ship gets sunk, but I'm pretty confident that's not happening. I'm also quite amused since I remarked in Doughnut Gunso's blog that it would be awesome if the villager was a "yandere" and that definitely seems to be the case here. It actually makes sense for Hata-sensei to get Hina's confession attempts (all 3 of them in a day) out of the way in a single chapter because, as hinted at in chapter 448, the larger King's Jewels arc is beginning to move again. Therefore, we can expect more developments on the "murderer on the island" subplot and what Athena is actually planning on this island by luring Hayate, Hinagiku and now Ikusa onto the island. Also, don't forget that the bet for the King's Jewel (the pouch, actually since the King's Jewel might not even be inside anymore) between Hayate and Ikusa is still on. 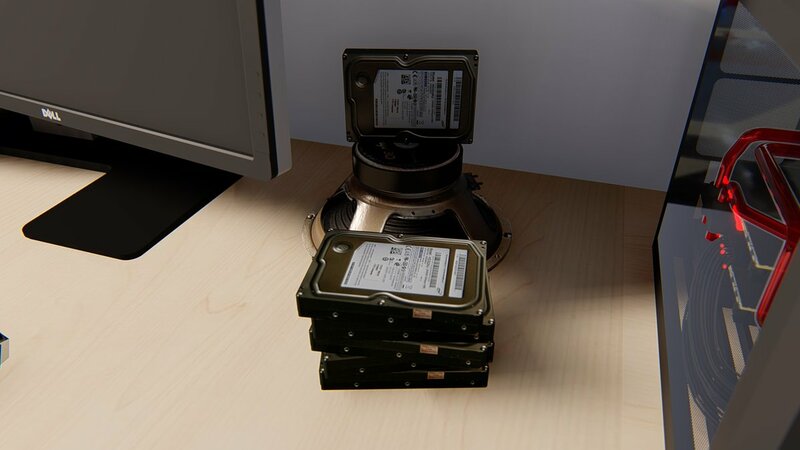 Edit: Here's something I forgot to mention. I'm actually fine with Hina saying that she doesn't care what Hayate thinks, because she needs to push through with her confession no matter what. I think it's been established with Nagi and Ruka as well that Hata believes that there's really nothing wrong with ignoring Hayate's feelings in the process of trying to get together with him. It might not be agreeable for everyone in real life, but I get the feeling that Hata believes it's really fine. I suppose one justification for this is that Hayate himself is just so oblivious that you need to try something desperate (such as confessing while falling from several thousand meters high) in order to get through to him. Speculation corner: Yeah, a bit unrelated to this chapter, but let's speculate a bit on the whole "blessed with luck" thing. Now we know that Yukariko apparently stole something from the Royal Garden and that she was apparently "loved by God." 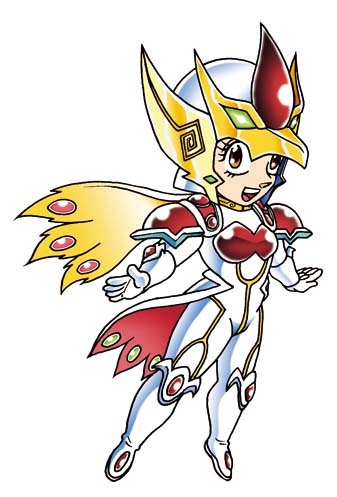 She also makes it point to tell Nagi that she would be watching her from the skies as a star. Since Hata uses long-term foreshadowing a lot and even the slightest detail might actually be a part of the main plot (Jenny's sister Hisui), I'm going to call out the theory that Yukariko might have been the one who "blessed" Nagi with good luck. As for the next upcoming events in this manga, I'd say that the "murderer" that Athena is looking for might be Himegami since it's been implied that he would play a part in the King's Jewels plot and he hasn't even made an official appearance in this manga yet. It would be interesting to know his character outside of his non-canon "Princess God" appearances in the season 1 anime since Nagi and Maria are pretty vague in the few instances that they ever talked about him. Ok, that's enough speculation for now, though. I'd like to see some speculation from my readers (assuming that I still have those :P). Now we all know that Ikusa probably outclasses Hayate in combat abilities at their base level seeing as how Hayate was pretty much in trouble when Robot Eight got serious, but Ikusa effortlessly destroyed him with a single kick... BUT, I'm sure that you would all agree that Hayate is at his strongest when Nagi is either kidnapped or under some kind of threat. It's been one of the oldest recurring themes of this manga since time immemorial... so, I drew this bit of fanart to illustrate a scenario that might give Hayate a fighting chance. When it involves Nagi, Hayate can enter an unofficially named "Demon Mode" that gives him somewhat superhuman combat abilities. 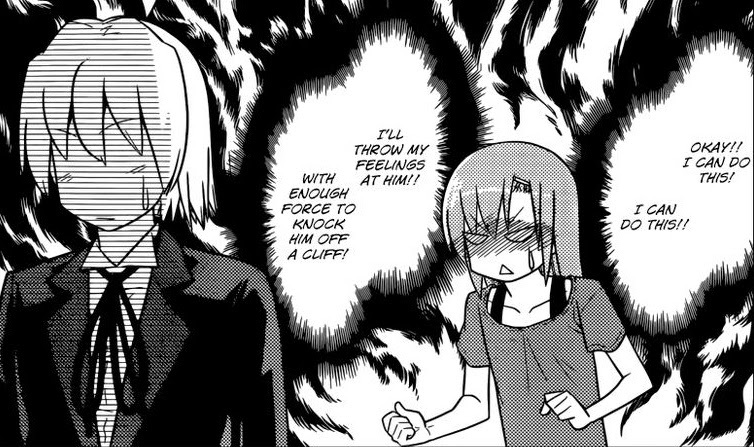 Also, Hayate has a special move called "Hayate no Gotoku" that he mastered and used just once in this 400+ chapter long manga in order to save Nagi. Now... given these advantages, who do you think would win in this fight? Ikusa or Hayate? Take your pick in the poll and let me know what you think in the comments. The original text I used was "come at me bro!" By the way, you might have noticed that I changed my blog header there. I used a digitized version of my "Nagi holding a placard" fanart. It comes with three character expressions. Feel free to save these images and fill in the placards with your choice of captions. I know some folks thought that this arc might resolve the romantic plotline between Hina and Hayate, but I was pretty sure the status quo would remain. As for the Japanese text, I'd like to see that as well since moon could be pronounced as "tsuki" which is similar to "suki" in sound. This is why I wish there were detailed translator notes to further explain things. Well, to be fair, it's not over yet. I personally think that the "ships" aren't as important to Hata-sensei nowadays as elaborating on the main plot... actually, it's always been that way, I think. It's the readers who just seem to blow the whole shipping wars out of proportion. I don't blame Hayate's "denseness" either, because I think it is natural for anyone to not understand what Hina says; rather, it takes some extra sensitivity or knowledge about the girl's feeling for him in the first place (which Hayate doesn't have) to catch on. To me it is just a series of (understandably) clumsy confessions which does not get through but also causes no harm. Yet Hina has moved from "can't spit it out at all" to "can't spit it out effectively". That's progress. Only Hata knows if Hina still has time and chances to make further progress. Then again assuming Hina's love story can survive the entire series, I am satisfied with her progress so far.